cobbler Archives - What the Forks for Dinner? One of the great joys of a garden, is the wonderful produce you receive,and receive, and receive …………..We have a lot of tomatoes. Correction we have a lot of small tomatoes. Just a heads up, if you ever want to plant cherry tomatoes……..1 plant will do……….they are prolific little suckers. But,they make a beautiful Tomato Cobbler. I must admit, this year was not my finest garden. The weather was odd, too wet, too cool, then too dry. Not the best growing conditions. But, what it did produce was……..well, wonderful! There is nothing in the world better than a home grown tomatoes. No store bought can ever compare……ever!! But what to do with them? One of my claim to fame dishes has alway been Bruschetta. I am always asked to bring it to gatherings. I think what really makes it good is the goat cheese that I serve with it. Now, I must give credit for the goat cheese to my friend Michelle. She introduced me to the combination years ago.THANK YOU Michelle! So, back to the tomatoes………I also think that balsamic vinegar brings out the very best in tomatoes……..it’s part of my bruschetta recipe, but I wanted to make a dish that was warm…..kinda stewed tomato like……only better. Tomato Cobbler………Scientifically speaking, a tomato is definitely a fruit. True fruits are developed from the ovary in the base of the flower, and contain the seeds of the plant. Today’s Science lesson…….lol. So, why not make a cobbler. I do not hold to the sugar on sliced tomatoes as many do, I prefer salt. 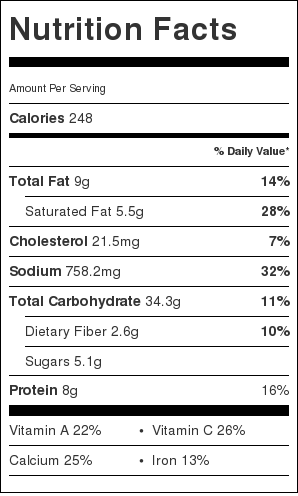 So, savory not sweet for a topping. 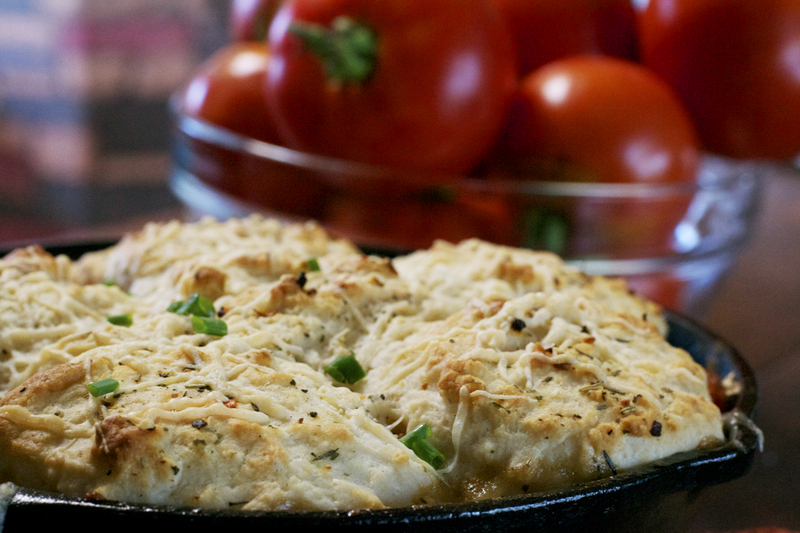 Biscuit came to mind, but so did goat cheese…….goat cheese biscuits?? You bet!!!! I replaced some of the butter with goat cheese……….OMG it was the perfect topping for the tomatoes, which were added to sautéed onions, and balsamic vinegar, with just a touch of flour to thicken. The biscuit are drop biscuits, so no messy rolling and cutting…….just plop them on top. A touch of parmesan on top during the last few minutes and you have Tomato Cobbler. Tim is not a fan of the tomato per say but, he really enjoyed the cobbler. It was a nice complement to a grilled steak. 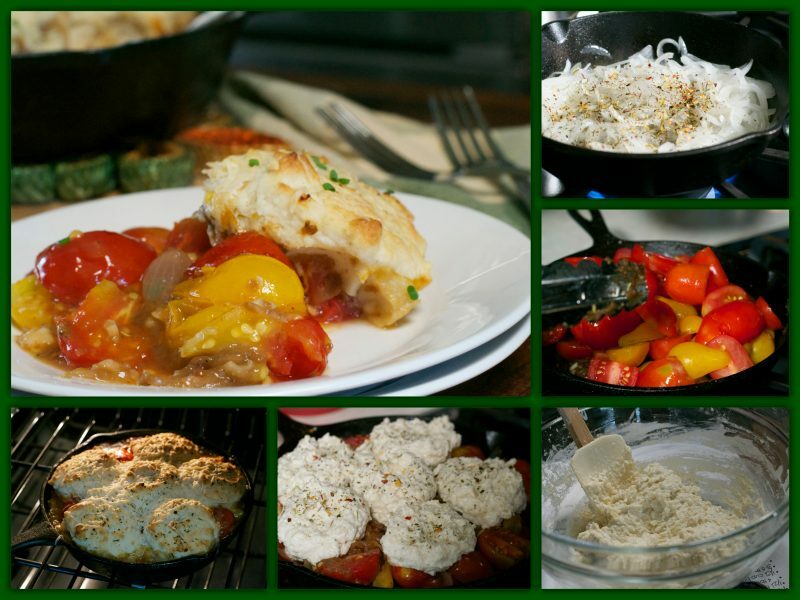 So, if you have an over abundance of tomatoes or are looking for a yummy tomato recipe……..Tomato Cobbler!!!!!!! Pick the stems off of the cherry tomatoes and rinse them under running water. Larger tomatoes can be sliced in half, but I generally just leave the tomatoes whole. Warm the coconut oil in a 10-inch cast-iron or high-sided stainless steel skillet over medium-high heat. When warm, add the onions, 1/4 teaspoon garlic pepper and 1/2 teaspoon of salt. Sauté until the onions are very soft and tender, about 10 minutes, Stir the garlic into the onions and cook until fragrant, 30 to 60 seconds. Pour in the balsamic vinegar and cook until almost evaporated. Stir in the flour and cook until the flour is paste-like. Remove the pan from heat. Add the cherry tomatoes and 1 teaspoon of salt, carefully stirring and folding until the onions are evenly mixed with the tomatoes. Using your fingertips cut the goat cheese and 3 tablespoons of cold butter into the flour mixture. Make a well in the center of the dry ingredients and gradually in the buttermilk. Slowly mix the dry into the buttermilk, stirring until just moistened (add more or less milk as needed). Drop the dough over the tomatoes, making 5 to 6 biscuits. Sprinkle the remaining 1/4 teaspoon garlic pepper over biscuits. 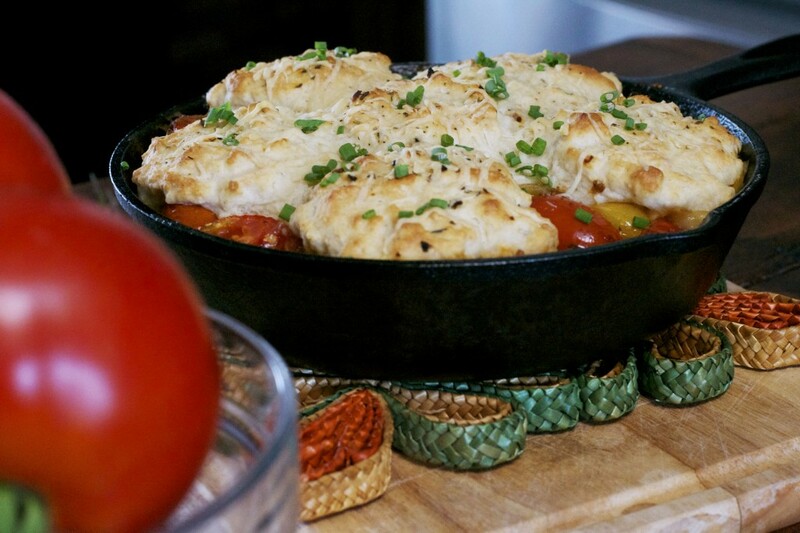 Cook for 45 to 50 minutes, until the tomatoes are very bubbly and the tops of the biscuits are nicely browned. Sprinkle with parmesan cheese and bake for an additional 8-10 minutes. Remove from the oven and let the cobbler rest for about 15 minutes….then enjoy! You can use any kind of tomato, just be sure to cut into bite size chunks. You can prepare this in a skillet and transfer to a baking dish if you do not have a cast iron skillet.